Keeping track of all the devices available for Windows artists is no small task, especially since manufacturers (and mainstream tech blogs) do such a poor job of calling out devices with active digitizers. We've been waiting for the mythical ATIV Q from Samsung since it was announced this summer, but it appears that device has been pushed into 2014, if it will be released at all. Samsung is a 5% owner of Wacom and includes pen support in many of its Android devices. They were among the first Windows 8 penabled device manufacturers with the 500t and 700t models. So why had they gone silent this fall? Turns out they hadn't. The Korean tech giant quietly refreshed the 500t and 700t last month, but also rebranded them as the ATIV Tab 5 and Tab 7, respectively. The Tab 7 is very similarly spec'd to the Surface Pro 2 (4/128). It retails for $200 more than Microsoft's tablet (slightly less via the Amazon link below), but includes a keyboard and sports a roomier 11.6 inch screen. Below is the full press release from Samsung. Going mobile doesn't have to mean sacrificing performance. Samsung's new ATIV Tab 7 puts power in the palm of your hand in the form of a tablet designed to fit your on-the-go lifestyle, while ensuring your contents stay synced anywhere you go. 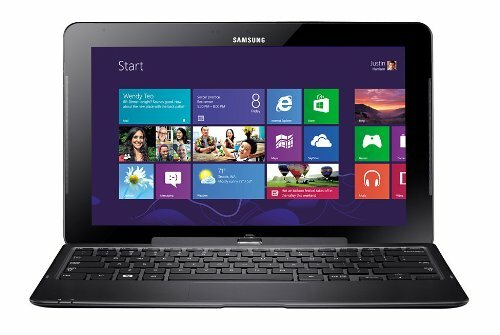 The groundbreaking design of the Samsung ATIV Tab 7 lets it work as both a laptop and a tablet computer. Just grab the tablet unit and hit the road when you want maximum mobility. When work that requires a conventional PC calls, just snap the included keyboard onto the base of the ATIV Tab 7, and there you have a full-featured laptop on your desk. Either way you want to work or play, the flexible design adapts to you—instead of forcing you to adapt to it. Tablet and smartphone users have become accustomed to using a finger to type, tap, draw and design on their touchscreens. That's OK for many chores, but when fine attention to detail is required, you're likely to need something that’s more accurate than the tip of a finger. Enter the S Pen™. This staple of the Samsung Galaxy Note tablet line is now part of the ATIV Tab 7, giving you the accuracy you need when writing and drawing on the screen of your tablet. The natural feel and pointed tip of the S Pen give you better control over everything you draw. Its 1,024 levels of pressure sensitivity let pen strokes and brushstrokes appear as thick brushstrokes or as barely-there spider webs, just like drawing with a conventional pen. The ATIV Tab 7 was designed with productivity in mind. Its 11.6-inch full HD screen, about the size of a standard sheet of paper, gives you plenty of room to work. As you use the ATIV Tab 7 you’ll notice other small, but handy features, like the slot designed for storing the S Pen. The ATIV Tab 7 includes a full-sized keyboard, touchpad, and two USB ports, so you can get even more done by adding peripherals like external storage devices, printers and more. At less than half an inch thick, the ATIV Tab 7 is slim enough to slip into a backpack, a purse or the seat-back pocket of a car. Whether you're an executive on the go, a traveler needing something to read on the plane, or a parent keeping the kids entertained, the ATIV Tab 7 is a companion that can go anywhere you or your family chooses to go. And don’t worry about running out of power. With a battery that can last as long as 5.5 hours, you can fly coast to coast or work all day without looking for a power outlet. Screen images simulated. Appearance and actual performance of device may vary. The above content is provided for information purposes only. All information included herein is subject to change without notice. Samsung Electronics is not responsible for any direct or indirect damages, arising from or related to use or reliance of the above content.